We currently run, and have since 2013, the 111 service in South East London, which covers the boroughs of Bexley, Bromley, Greenwich, Lambeth, Lewisham and Southwark. Our new, fit for purpose offices are based in Croydon, where we employ around 120 staff. We are the only NHS Trust delivering 111 services in London. Although we deliver our services to the geographical area of South East London, we work in partnership with the other London providers to ensure consistency across the Capital in terms of high quality patient care and good outcomes. We provide the 111 service using an evidence-based, clinical decision-making software called NHS Pathways. All of our staff are trained to use this system, and undergo an intense training course for health advisors and an additional component for registered clinicians (nurses/ paramedics). 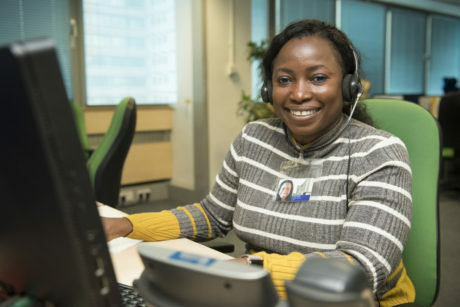 Staff spend a period of time with an experienced member of staff where they are supervised and assessed taking live calls prior to being signed off as competent. Regular audits are then undertaken for every staff member on a monthly basis. We are proud of the service we deliver for South East London. We consistently transfer less calls to 999 than the national average and our 111 service benefits from a close working relationship with our 999 service. Working for us – if you would like to work for our 111 service please visit our vacancies page. All current London Ambulance Service vacancies are advertised here. Feedback – We pride ourselves on our excellent customer service, but if you would like to thank our staff, or something’s not quite right, we’d really like to hear your feedback to help us improve. Visit our talking with us page.